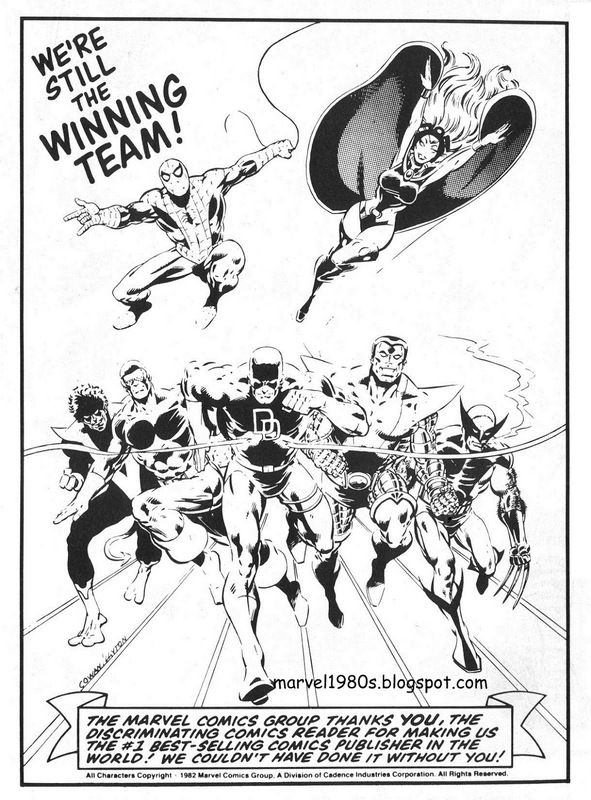 Marvel Comics of the 1980s: 1982 - Marvel ad in Amazing Heroes - We're Still The Winning Team! 1982 - Marvel ad in Amazing Heroes - We're Still The Winning Team! Grabbed from Amazing Heroes #6. Drawn by Dennis Cowan and inked by Bob Layton. Love how Wolverine's running the race with his cigar! A bad year for the Avengers! None of them rated inclusion? Daredevil at center stage: never before and never since! I guess Frank Miller gave him a popularity spike around this time. Personally I love (pre-Miller) DD but he seems to be forgotten more often than not. Mark Waid has been doing an amazing job capturing that pre-Miller DD. Have you been reading his latest run? I have not. They market comics so poorly I wasn't even aware of it until around issue 20 and then the cost per issue is prohibitive. The art even looks good, unusual for a modern comic. If I can find a reasonably priced TPB I might read it. So far I keep seeing thin hardcovers with prices way too high.